All along Mike’s journey several people kept saying you need to get on the ipilumumab trial. So when it was clear after two rounds of chemotherapy the cancer was still spreading like wild fire, and after his admission to Southampton General Hospital being unable to breathe, we were accepted into the “Ipi” trial. We now knew that this was our final hope and Mike was still willing to give anything a go. There was a two week wait to get accepted into the trial and for the drug to be brought in from America and then we were good to go. 3rd March 2011. 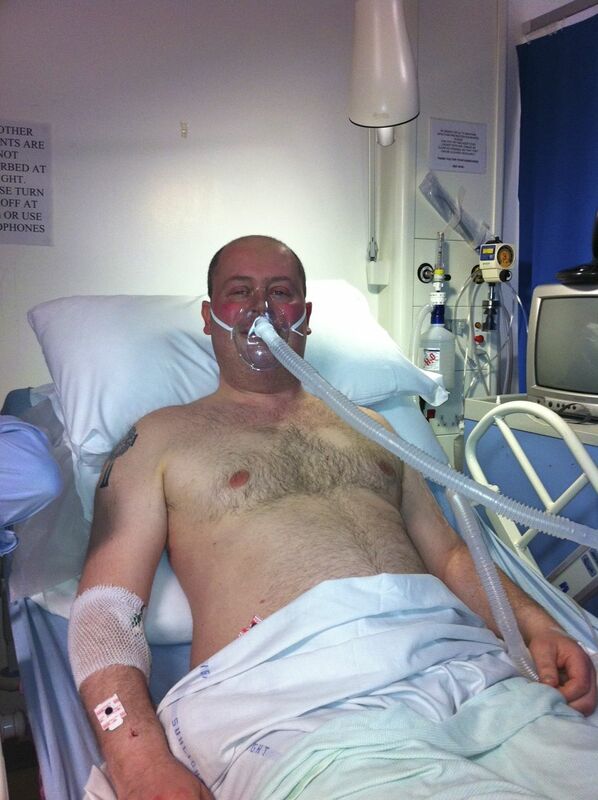 Mike in SGH with blood clots on lung, chest infection and severe rib pain. From the outset we were hopeful that it would have a good effect and were told there was no good reason that it wouldn’t also affect the brain mets, which was good news. However we were also told that early indications in the trial reports, were that it could take anything from between three months and a year for the positive affects to show and that often tumours appeared to get worse before any improvements were seen. This was worrying given that in a six week period Mike’s CT scans showed that the disease had significantly worsened in his existing tumours and there were new ones. However as i say we remained hopeful and on the 18th March we went back to Southampton General Hospital to commence the Ipi. It was a long and frustrating day. It started with Mike having the largest amount of blood i have ever seen anyone have, unless you were actually donating it! They were checking for the routine things they do, like your full blood count and liver and kidney function etc, but there were also huge tubes to be filled to test for all the trial related bloods. I believe a lot were looking at the immune response and it is an immunotherapy. After the bloods we waited to see the consultant and as we all know they are never on time, however we would wait all day to see Professor Christian Ottensmeier! I have never met such a positive yet realistic and compassionate consultant. Most of his and Mike’s time was taken up discussing the latest Apple products on sale and debating their merit, rather than focusing too much on the cancer. I’m inclined to agree Apple products definitely trump cancer, if only Apple had an “App” for that! Following the consultation and formalities of informed consent etc (oh and the race for the Ipad 2 the following week), we then just had to wait to get the drug. We were told that they were running about an hour behind, so disappeared off for a healthy lunch (BurgerKing) and two hours later were still waiting! Mike was tired and frustrated by this point, so we enquired again as to what was happening, only to discover that we had not had any “chair time” booked. Having never had intravenous chemotherapy, we had no idea what the process involved and so were unaware we needed two different appointments. (Top tip for future recipients.) Anyway after many apologies we were all hooked up and ready to start the one and a half hour infusion before heading home. It was good to get the first dose done and out of the way and we left with the dates and chair times for the next three infusions at three week intervals. The following few weeks were more of the same, in and out of the hospice with various problems, the biggest of which was persistent constipation and we had the gamma knife surgery in between also, which really wiped Mike out. The night before we were due back at Southampton for dose two Mike developed severe diarrhoea and stomach pain. We had been told that this was a side effect of the ipi and we must contact the consultant urgently if he developed any side effects. It sounds strange but i was pleased and relieved (understandably, Mike not so much), because side effects were a good sign that the Ipi was working. Much to Mikes disappointment we got admitted to Southampton General, where he underwent an Endoscopy and Colonoscopy to look for any signs of inflammation in the bowel. Both tests came back clear, but he was started on different steroids for inflammation in the stomach anyhow. These steroids, Prednisone, were unusually used in combination with the Dexamethasone due to the recent gamma knife surgery on his brain. He spent one night in hospital and slept a lot, but was adamant he was coming home the following morning. So we collected him and brought him home where we had a few rocky days. Needless to say we missed dose two of the Ipi just to let things settle, but Mike was just pleased to be out of hospital.